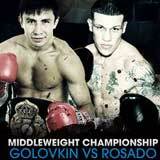 Review: 2013-01-19, nice and tough fight between Gennady Golovkin and Gabriel Rosado: three stars. The undefeated Gennady Golovkin (24-0-0 with 21 victories coming by way of knockout) entered as the No.4 middleweight in the world while Gabriel Rosado (21-5-0) entered as the No.10. Golovkin vs Rosado is valid for the WBA and IBO middleweight titles; undercard of Orlando Salido vs Miguel Angel Garcia. Watch the video!